Arnaldo Xavier da Silveira’s Endorsement of True or False Pope? FORMAL REPLY TO FR. KRAMER'S250 PAGE ATTACK ON "TRUE OR FALSE POPE?" In this four part series, we will reply to Fr. Kramer’s 250 page attack on True or False Pope? In Part I, we will address three key “heresies” Fr. Kramer accuses us of holding concerning the specific issue of how heresy severs a person from the Church, from which are borne the two main straw man arguments he attacks throughout his book. We will demonstrate that all three accusations are entirely false by quoting directly from our book. Once these accusations of heresy are shown to be false, the two main straw man arguments – which together constitute the foundation he spends most of his time attacking - will be removed; and when the foundation is taken away, all the arguments and false accusations of heresy erected upon it will crumble (which will then require that Fr. Kramer re-write his entire “refutation”). True or False Pope? is the most thoroughly researched, detailed and systematic refutation of Sedevacantism that exists. 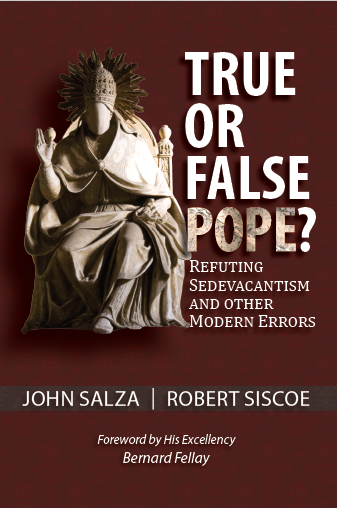 In this 700 page tome, John Salza and Robert Siscoe present material from Popes, ecumenical councils and Doctors of the Church that you will never find on a Sedevacantist website. Quoting directly from today’s leading Sedevacantist apologists, Salza and Siscoe reveal how Sedevacantists have distorted the teachings of their favorite Popes and theologians, especially St. Robert Bellarmine, and how they even contradict each other. The book also reveals the many unfortunate tactics used by Sedevacantists in an effort to “prove” their case. The authors begin by demonstrating that Sedevacantism logically results in a denial of the attributes (visibility, indefectibility, infallibility) and marks (especially apostolicity) of the Catholic Church. After explaining the bonds that unite man to the Church, the authors explain the distinction between heresy and lesser errors, and how the sin of heresy alone does not sever one from external union with the Church. The authors then go on to provide the most detailed analysis in print of what the Church does in the case of a heretical Pope, based upon the teachings of all the classical theologians who addressed the topic. After a very important explanation of the scope of infallibility (papal, conciliar, disciplinary, New Mass, canonizations), the authors address Sedevacantist arguments against the new rites of episcopal consecration and ordination. The authors conclude by affirming the Recognize & Resist position of Traditional Catholics, and expose in great detail the bitter fruits of Sedevacantism. This groundbreaking work proves the Sedevacantist thesis is an overreaction to the crisis in the Church, akin to the reflexive “faith” of Protestantism. This explains why Sedevacantists are divided into many competing factions and sects (some of which have elected their own "Popes) that contradict and condemn each other. The book also underscores that the Church is currently suffering a mystical Passion similar to that of Our Lord Jesus Christ. Like those who lost faith in Christ during His Passion, Sedevacantists have lost faith in the Church, His Mystical Body, as it passes through a similar Passion of its own. Having lost their faith in the Church, they have become among her most bitter persecutors. No matter what one’s perspective is on the crisis of the Church, anyone who reads this book will conclude in no uncertain terms that Sedevacantism – one of the great modern errors of our times – far from being a “solution” to the crisis, cannot be held or defended in good faith by any true Catholic. PART I: FORMAL REPLY TO FR. KRAMER'S 'DEFECTION FROM THE FAITH' AND ATTACK ON "TRUE OR FALSE POPE?"